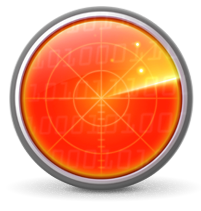 Everything you need to know about torrent monitoring and how to protect yourself against it. Hide your file-sharing from torrent monitoring. But I Swear I Didn't Download the Torrent it Says I Did! Unless you take certain precautions, your ISP can easily monitor your torrenting, if it is unprotected. This should make sense to you because all of your Internet data travels through your ISP’s servers, equipment and infrastructure. If your ISP doesn’t like what it sees, it could “throttle” or “shape” your connection (slow it down), issue you a formal “strike” warning, cancel your account and maybe even blacklist you. Top Tip – If you want to hide your torrenting from your ISP, use a reliable and trusted torrent VPN such as NordVPN or Private Internet Access. Doing so will fully protect you from torrent monitoring. If a third party snoop wants to monitor torrenting, he/she only needs to share the same torrent, join its “swarm” (meaning all the people sharing that same torrent) and then record all the IP addresses sharing the torrent in that swarm. Armed with this list of IP addresses, the snoop can then trace each IP address back to its source. This will lead them to your ISP and then to you. That's because ISPs keep connection logs on which of its customers was using a given IP address at a certain time. This is how snoops can trace torrenting back to specific individuals. By definition, torrent file-sharing (and its underlying peer-to-peer or P2P technology) means sharing files. OK, so far, so good. But in order to share files, torrent users must connect to one another and this is done by exchanging IP addresses in the swarm. If you are downloading or sharing a torrent, snoops can see your IP address, record it and trace it back to you personally through your ISP's logs, to take follow-up action. Yikes! In other words, torrent file-sharing = sharing IP addresses. Comes with a 30-day full money-back guarantee. You can see this for yourself. Select any active torrent in your torrent app and look for its 'Peers'. For example, in µTorrent, look for a Peers tab (see screenshot below). There, along with some other details such as download and upload speeds, you will see the IP addresses for each of the other torrent users (peers) downloading the torrent. Plus, it's easy for snoops to automatically record these IP addresses. And once recorded, the IP addresses can then be traced back to each user's ISP and, from there, to you. To see how easy it is for snoops to monitor and record torrent file-sharing activities, check out the public sites, ScanEye and IKnowWhatYouDownload. To see a simplified example of how torrent downloading can be mass monitored, see the ScanEye Global BitTorrent Monitor. The site automatically detects your IP address and then checks it against a database of torrent downloading activities. All seeing torrent monitoring eye? If you perform the check and your IP address shows up as “clear”, click on the DEMO button to see the kind of information that snoops can easily obtain about unprotected torrenting. And remember, just because your IP address is clear at ScanEye, this doesn’t mean your torrent downloads haven't been monitored and recorded by some other torrent snoop. Like ScanEye, IKnowWhatYouDownload has a huge database of IP addresses harvested from torrenting. Check to see if yours is among the 700,000,000 peers they monitor daily. Here are two similar, but now dead, torrent monitoring sites that caused huge outcries years ago. 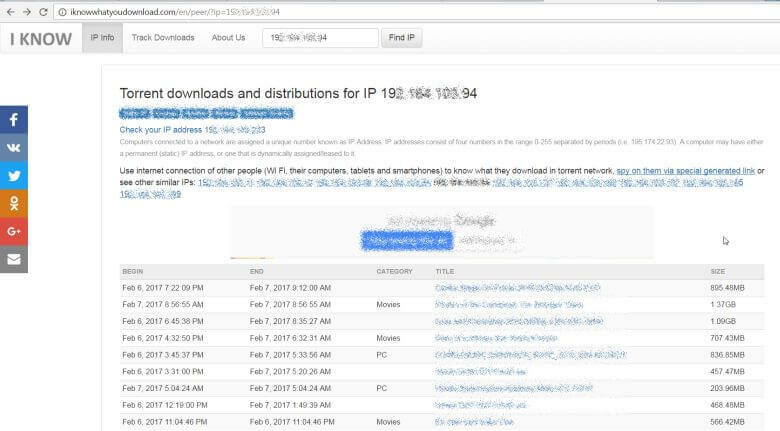 Like ScanEye and IKnowWhatYouDownload above, these sites also had a searchable database of monitored torrent by IP address. And remember, all of these examples are just simplistic public sites: well-funded adversaries have much more sophisticated and secret means for monitoring torrent users and going after them. Shared IP addresses are a pool of IP addresses that your ISP allocates among many of its customers over time. But don't think that you can “hide in the crowd” this way to protect your torrenting from monitoring. It's not so simple. Even with shared IP address, the snoops can request or even compel your ISP to disclose their connection logs. With this information, they can confirm which of the ISP's specific customers was using the shared IP address at any given time. In other words, snoops can trace your torrent activities back to you even if you use an ISP with shared IP addresses. Shared IP addresses can also lead to search results on torrent monitoring sites that are “false positives”. This happens when it shows that you downloaded a torrent, when really you didn't. These kind of results can occur when your ISP uses shared IP addresses. For example, the IP address your computer or device is using when you check a torrent monitoring site may have already been used by someone else. If that other person downloaded a torrent with the IP address that you are now using, the torrent monitoring site will report that it was you who downloaded the torrent. However, if a snoop monitoring torrents actually traced the IP address back to your ISP and looked at the connection logs at the specific time the torrent was being downloaded, the snoop would learn that the person that actually downloaded the torrent was not you. The best techniques for avoiding torrent monitoring and keeping your IP address hidden have been collected here, How to Download Torrents Anonymously. If you just want to know the bottom line to protect your torrenting from monitoring, it's to use a torrent-friendly, zero-logging VPN. This will keep you safe from torrent monitoring. Let's look at each of these 2 key elements in more detail. Remember above when we said that torrenting means sharing your IP address? At the end of the day, if you want to torrent, you will need to share your IP address with other torrent users to get the files you want. That's where a torrent VPN comes in. The VPN hides your true IP address. This means that any torrent user (or snoop!) sharing a torrent file with you will never see your true IP address. Instead, they will see an IP address issued to you by the VPN service. The VPN acts as a shield in between you and the torrent swarm, hiding and protecting your IP address while torrenting. And if you make sure to use a VPN that keeps no logs, this combination makes it virtually impossible to trace torrenting back to you. Please be aware that logging policies vary between VPN providers, so you must choose your torrent VPN carefully. This is the best way to make your torrenting as safe and protected as possible. When connected to a VPN, it encrypts your entire Internet connection. It does this by sending your traffic through a protected data tunnel to and from the VPN's own servers. Because your torrenting is protected inside this encrypted tunnel, your online activities are hidden from snoops, even your own ISP and anyone else who may be trying to monitor your Internet connection. The one-two punch offered by using a good, no-log VPN -- hiding your IP address and encrypting your connection -- means you can happily torrent without having to worry about your downloads being monitored and traced back to you. For such a low cost, a VPN is worth every penny in keeping your torrenting safe. Plus, a VPN has dozens of uses too.